Madewell is having a moment right now. Like it's sister store J.Crew, they run hot and cold with me (recently J.Crew was hot in my opinion as I shared in this post). 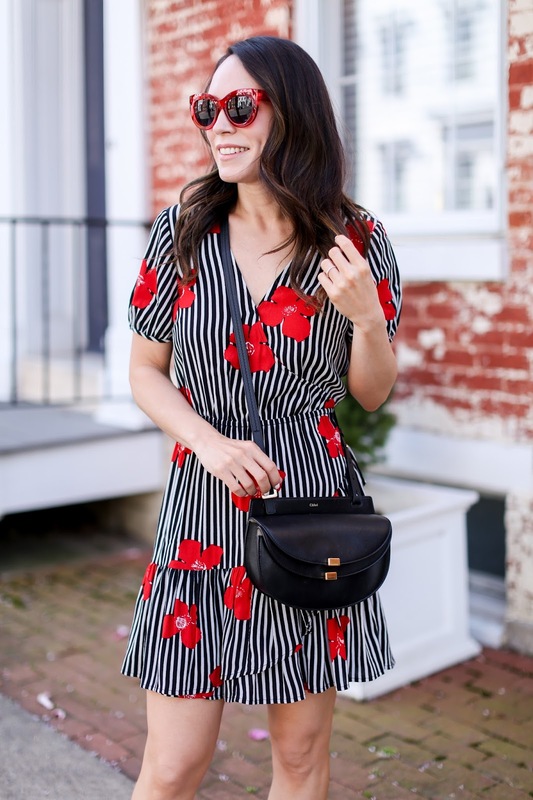 Sometimes everything on Madewell's site (and now Nordstrom - whoop, whoop!) is an *add to cart* and other times it all looks so frumpy/boho/schoolmarm-ish. Does anyone else feel that way about them? Well it looks like spring is Madewell's time because there are quite a few adorable numbers on their site. And then Nordstrom began carrying them and all became right with the world. In fact, if we are being completely frank, the photos and styling on the Nordstrom site makes me like the clothing more than when it's on the Madewell site. I actually saw the same item on both sites and did a double take many times on Nordstrom.com because it presented the item much better. I had been eyeing the wrap shirt version of this print, but ultimately felt that the dress seemed more my speed. One and done! Isn't getting dressed in the warmer months the best? Dress, shoes, bag and I'm out the door. (maybe sunglasses if I remember LOL) And you can see my big cheesy smile in these photos because the weather was absolutely glorious the day I wore this dress. Quintessential spring temps complete with blooming trees, a light breeze and no humidity. Doesn't get much better than that. Peruse all the widgets below to see my picks from both the Madewell site and Nordstrom (it seems they carry different inventory). Hi Maree - i'm wondering if you a do a YouTube what's in my bag/what fits in your Chloe Georgia bag. I really enjoyed your Gucci what's in my bag and I'm curious how much the Georgia holds. I know it's been discontinued, but I've seen some in the pre-love market and can't quite make the leap to buy it. Thanks! Hi! Since it's discontinued, I don't think I'll do a video, but I can definitely share what fits in it. I can get a phone, keys, lipstick but not my full size wallet. A smaller card wallet would fit, but not my large one. I typically have to take out my license and credit card and put it in separately. Seems annoying but I don't mind since it is so lightweight and easy to carry. I understood that I wouldn't be able to get my wallet in it because I tried in store.